Earlier this month, we wrote about topaz, and today we are going to talk about the other November birthstone: Citrine. Citrine is a quartz stone, and one of the most popular yellow stones. It gets its color from traces of iron and comes in colors ranging from pale yellow to deep brown orange. Because of its color, which can be very similar to topaz, the two stones are often confused. It is quite rare to find natural, untreated citrine, and most of the citrine available you find is actually amethyst (lanka till amethyst post here) or smoky quartz that has been heat treated to bring out the yellow color. Citrine is also the 13th wedding anniversary gemstone. 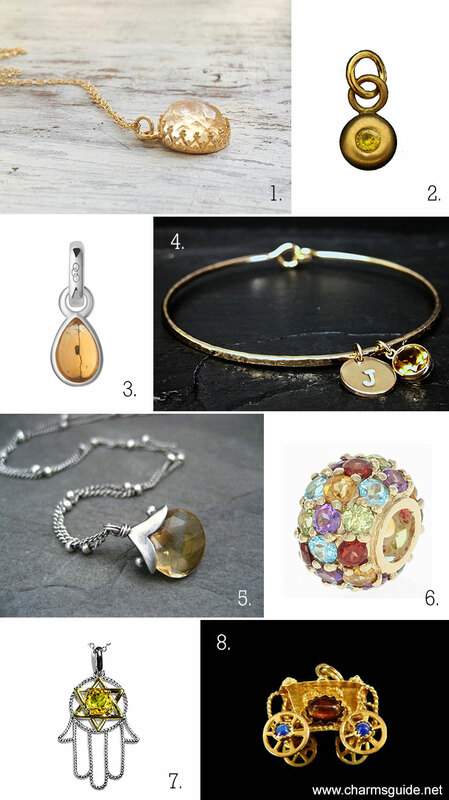 Citrine has been popular since ancient times and is a great stone to wear or carry in your pocket! It is said to remove negative energy and radiate positive energy. It is thought to bring joy, happiness, comfort and warmth, help clear the mind, promote self-esteem, and awaken imagination and creativity. It encourages new beginnings and attracts success, abundance and prosperity. It is also believed to help with stomach and sleep issues, and with heart, liver, kidney and thyroid disorders. 1. 14kt gold filled necklace with a beautifully set citrine pendant. Handmade necklace by Avnis. 2. 14kt gold charm with a round faceted citrine gemstone. Handmade by Luxe Design Jewellery. 3. Sterling silver charm with a pear cut citrine that can go on either a necklace or a bracelet. Citrine charm from Links of London. 4. 14kt gold filled bangle bracelet with a citrine charm (and an optional personalized disk charm) by Niccoletti. 5. Beautiful necklace with a faceted citrine briolette with a handmade sterling silver cap. November birthstone charm necklace by Elfi Roose. 6. 10k yellow gold charm with garnet, amethyst, topaz and citrine gemstones. Fits European style slide-on bracelets with up to a 5.3mm chain. Multi-gemstone bead charm from Wilson Brothers. 7. Two tone 10kt gold hamsa hand with a Star of David set with a citrine stone by Star K.
8. Vintage 18kt yellow gold charm with amethyst, citrine and lapis lazuli. 1930s carriage charm from HPS Jewelers.